Allentown, known for its incredible downtown city views along Grandview Park, is becoming the talk of the town for businesses and individuals drawn to its low rent and housing costs. 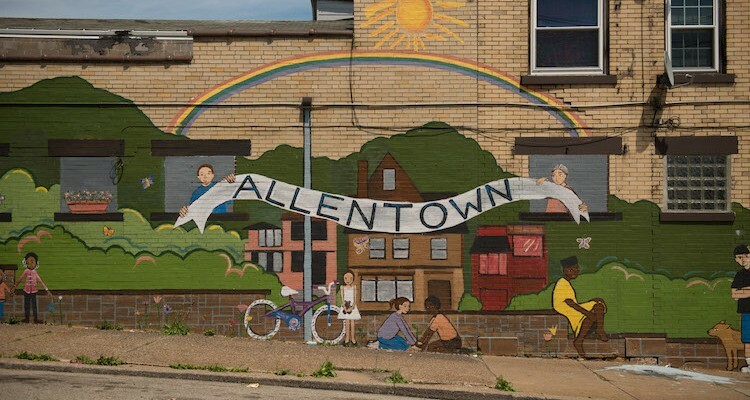 The quickly rebounding neighborhood of Allentown lies between Mt. Washington and Beltzhoover to the west and the South Side Slopes to the east, with Knoxville due south. Grandview Park, with some of the best views in the city, forms Allentown’s northern border. 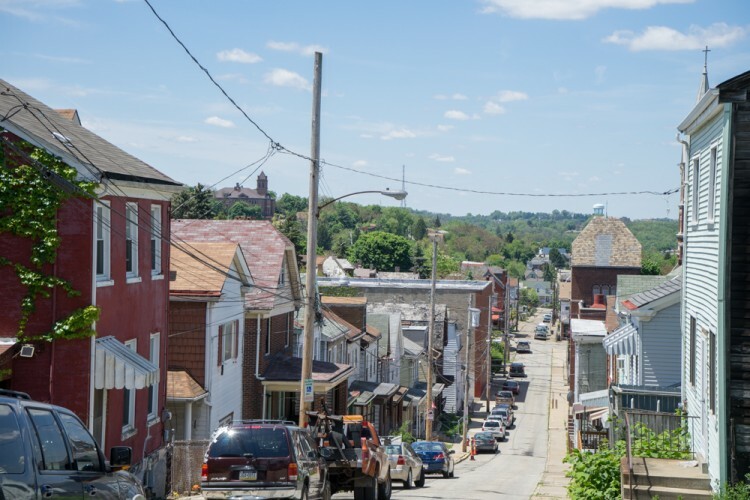 Back in the day, many of the steelworkers and other laborers who could afford it would leave the South Side and move to Allentown, where the air was fresher and the crowds smaller. The same is true today, except that now it is much cheaper to live in Allentown than it is the South Side. According to Niche, the median home value in Allentown is $39,646, versus $211,722 in the South Side Flats. Also, on average, it is nearly $300 cheaper to rent in Allentown than it is the Flats. Allentown streets. Brian Conway photo. Most of Allentown’s growing business district is centered around a small, walkable stretch of E. Warrington Ave, a main street brimming with possibility and brick storefronts. Black Forge Coffee, the only heavy metal coffee shop in town, creates a much-needed “third place” where members of the community can meet and gather. There are more than a few dining options along East Warrington, including a pair of pizza shops, DeSalla’s and Paisano’s, the Carribean Leon’s, a diner (we love their breakfast burritos) called Breakfast at Shelly’s and the higher-end and much-loved Alla Famiglia which has been a mainstay for decades. These days, artisans and makers are moving in by the droves to take advantage of Allentown’s low rents, including a guitar maker (Stuart Day Guitars) and RIP PGH, a signmaker and fabrication/design firm. Real estate company RE360 also calls Allentown home and their Industry on Industry building was the site of a festive kickoff for the NEXT 3 Days Hilltop event which drew a large crowd to a neighborhood many weren’t familiar with. While there is no grocery, there are a handful of corner stores as well as a Family Dollar. Photo by @haggertymedia, winner of the Steel City Grammers contest during NEXT 3 Days Hilltop. In the summer, the Grandview Park bandshell is home to weekly free movie screenings courtesy of the City. 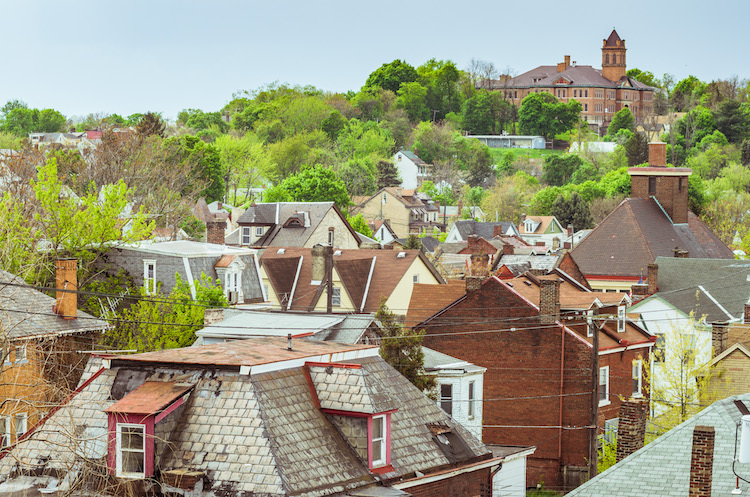 There is also a children’s playground, basketball court, and world-class views of Pittsburgh and the surrounding Hilltop neighborhoods. The inclines and trolleys of yore are but a distant memory, but East Warrington Avenue is still equipped to handle rail traffic, and the T passes through whenever there’s a detour elsewhere on the line. Allentown is also served by the 43, 48 and 54 bus lines. Time will tell if the T returns to Allentown. What is no longer in question is if Allentown will reemerge: that is happening now and for many, it’s a joy to behold.